Are you the next 180 Degrees Consultant? Posted on behalf of 180 Degrees Consultants: Nicole McRae, Marcus Siregar, Hannah Kennedy and Kris Varanyuwatana. 180 Degrees Consulting is currently recruiting for Semester Two. Head to www.180dc.org/canterbury to apply by Sunday 26 July and become a part of the world’s largest student consulting organisation for social impact. In the first semester we all successfully applied to be part of 180 Degrees Consulting here at the University of Canterbury. Our client for the semester was Project Lyttelton. They hired us to conduct a cost-benefit analysis of land remediation methods for their community garden. Our team was made up of Kris (Marketing), Hannah (Accounting), Marcus (Law) and Nicole (Environmental Science). The first challenge was figuring out our strengths and weaknesses since we all come from such different disciplines. We all found the process to be a nice break from academic life. Knowing that we were using our expertise for such a good cause was very rewarding. 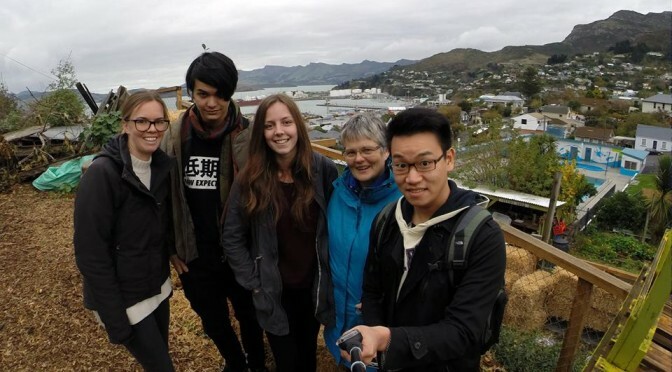 It is a unique experience being given the chance to provide such valuable information to an amazing charity like Project Lyttelton. Knowing that they respected our research and decisions was very humbling. Being part of 180 Degrees Consulting is so much more than just meeting clients and communicating research. There are numerous training sessions and each week you get to meet up with your group meaning you become great friends. The exec provides an excellent supportive environment and there are also numerous networking opportunities with industry leaders such as PWC, nonprofit organisations and social enterprises. We have all valued the opportunity to make a positive difference in the community and cannot wait to be involved again in semester two. Nicole, Marcus, Hannah and Kris. Did you get your free Office 365? 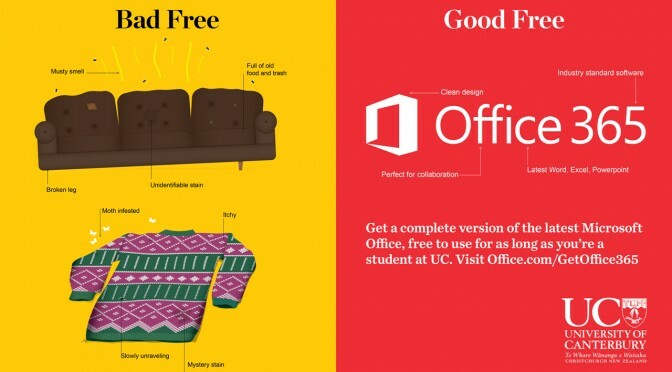 At UC we like to help our students save money and this free Microsoft offer does just that! All enrolled students can download Microsoft Office 365 for free, so why wait? You get: Word, Excel, PowerPoint, OneNote, Outlook, Publisher and Access. The download is 1GB in size and you will require 3GB of disk space. Be careful: if you’re on campus this will use your internet allowance so check your credit first. If you choose to download the software while on campus, it’s best to use the network ports provided in the Central and Education libraries rather than wireless (internet charges apply).